In the mood for Dark Energon? Have a thirst to annihilate your own planet? Then you'd make great friends with Megatron from the War For Cybertron video game. The figure's been redone by Takara into their United toy line, featuring some darker paint job and a more 'evil' feel. 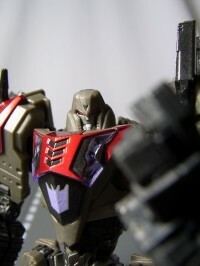 Seibertron.com News Crew member Mach has notified us that Alfes 2010 has updated his blog with images of the figure, as well as comparisons to Hasbro's Cybertonian Megatron. Thanks to Alfes 2010, the first wave of United figures are well documented. You'll find Voyager Megatron here, and the remaining eight here. And of course, pictures of this Megatron below! So much nicer, which is why I pre-ordered it. United looks better in ALT mode. Hasbro's Looks better in robot mode IMO. Megatron wasn't that dark in the game. Both look great to me. I'm going with United though. He'll fit in with the other shiny United WFC guys. Odd, he almost looks TOO dark here. I can understand why people feel he doesn't look right. A bit too dark. But I really quite like it. There's no mistake that he's an evil tyrant with Takara's figure. But what's with the weird Decepticon logo on his chest? I quite like the "brown". It's a fresh take on his color scheme, while remaining dark and frightening. Though I usually prefer Takara's more detailed paint apps, a gray-brown Megatron just isn't right. They could have gone easier on the brown, if you ask me. I just checked the boxart on my WFC game, and Hasbro's color scheme is actually the more accurate one. I'm glad I bought the Hasbro version. weird. earlier pics made him look really good, but now, and with the side by side, I've got to give it to the Hasbro one, even though that is too light. Love the red on the United version and the darker, metallic paint does make the details pop more, but...maybe I'll just get WFC Optimus and Soundwave. Big freakin deal. Cybertron Megatron. SN95 Cobra R wrote: Big freakin deal. Cybertron Megatron. what should we be discussing in the Cybertron Megatron thread then? The awesomeness Moderating of Counterpunch and myself. I just got my shipping notice from HLJ. Yay! Why do I like him? Because he's a dirty dirty robot. Sorry, but not only do I like bricks, I also like my giant freaking machines of war to not be polished and shiney. There are elements of each that I like, but I'll be sticking with my Hasbro version. The red parts are amazing, but the overall color just doesn't seem like megatron to me. I think its funny how some refer to the color as brown. I can see why but at the same time not. This darker richer color can only be fitting for this long time favorite decepticon leader. IMHO the reddish like paint apps are bolder and add more striking fear in this Megatron...'nuff said. 5,124 pages were recently viewed by 1,004 unique visitors. This page was viewed 1 times on Thursday, April 25th 2019 9:21am CDT. © 2019 Seibertron, Inc. DBA Seibertron.com. All Rights Reserved. Established June 2000. Seibertron.com is owned by Ryan Yzquierdo.